Caption: Consistent, quality staffing is the secret to healthcare success or failure. So St. John Specialty Care Center embarked on a targeted campaign to recruit and retain top quality staff. Kabob (Althea Goldie, Activities), the "Home Team" mascot poses in front of a replication of a baseball stadium scoreboard. The scoreboard is used to educate staff and to celebrate successes. Like most healthcare facilities across the nation, St. John Specialty Care Center has also experienced the challenge of finding qualified, licensed nurses. And for good reason -- according to the American Hospital Association, 13 percent of nursing positions nationwide are vacant and 20 percent are likely to be vacant by 2015. Plus, the experts also report that the average nurse today is about 48 years old, which means in the next decade a large percentage of nurses will be retiring. What do you do when the indeividuals who touch the lives of residents in a way that very few health care professionals do, become an endangered species? Like many other healthcare providers, St. John developed a greater dependence on outside nursing agencies to suppplement our staff, to the tune of $1.7 million in 2003. "In addition to the financial impact of agency usage, there was also the concern that the continuity of care for our residents could be diminished. There is nothing more critical in today's lng term care environment than providing consistent service by nursing personnel who know the physical and emotional needs of the inddividual", said John L. Spieler, Executive Director. In January 2004, St. John, with the support of Maun-Lemke, a human resource consulting firm in Omaha, NE, embarked on a proactive and positive campaign to eliminate dependency on nursing agency staff. At the same time a renewed commitment was made to emphasize quality and continuity of care through exceptional recruitment, selection and retention, with the outcome being a more abundant like for residents and staff. The campaign adopted a baseball theme and was driven by the "Home Team", an interdisciplinary group of dedicated members who coordinated the implementation of the first 12-week action plan in March 2004 with outcome-based written goals. The initiative revolved around three areas--recruitment, selection and retention--with the ultimate goal of becoming agency free by Thankgiving Day, 2004, thus crating our own Home Team Advantage! We had a pubilicity team that promoted and educated staff regarding the purpose of the initiative and kept enthusiam high with celebrations, incentives and games--most often our very own mascot, Kabob was at the forefront of the festivities. The "Home Team" kept score and reported weekly on their achievements, in areas such as diminishing agency usage, improved hiring and selection, turnover reduction, encouraging taff to pick up extra shifts and reducing absences and tardiness. In keeping with the baseball theme, scores were recorded ona 21-foot, main corridor scoreboard complete with stadium lighting and a computerized message board. We clebrated our successes and rewarded individuals and teams when goals were attained. 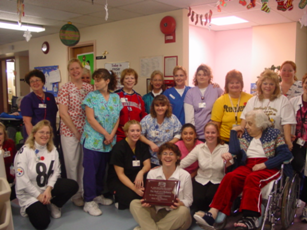 On October 24th, 2004, one month ahead of schedule, St. John Specialty Care Center achieved agency-free status. "St. John embarked on an extremely challenging journey but they made it happen through their amazing team-based efforts", said Clint Maun. On December 3rd, St. John staff on all three shifts participated in a Team Spirit Celebration that earmarked the elimation of dependency on agency staffing and raised up the great teamwork that enable us to meet our goals. Ina special edition of the Seventh Inning Stretch, our newsletter communicating information about the "Home Team" project, John Spieler stated, "Your hard work, open minds and positive attitudes were instrumental in accomplishing our initiatives and will enable us to continue our process improvement to make St. John a great place to live and work. We will use this synergy and continue to privide an Abundant Life for our residents and staff." 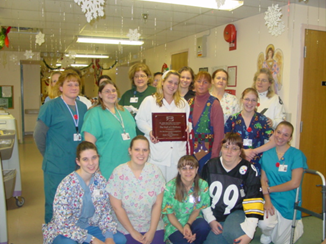 Caption: The "Home Team" focused the initial process improvement on 2 Bethany, a 60-bed subacute unit (R) and 3 Bethany, a 60-bed skilled nursing unit because they had an distinct need for consistent staffing due to the medical acuity of the residents and higher agency usage. According to Pearl Been, RN, Director of Nursing, "The key to the success on these units was the level of excitement and commitment displayed by team leaders Liz Studeny, RN (2Bethany) and Tracy Tresky, RN (3B). The photos show each unit as they proudly display their achievement awards.